One of the miracles of the Italian post-second world war industrial revolution was the transformation of a few small motorcar coachbuilders into international style leaders that then became sought-after design consultants for the motor industry and, finally, completed the transition to making cars. Always at the forefront of these developments was the house of Pininfarina whose head for 40 years was Sergio Pininfarina, who has died aged 85. The company was founded by his father, Battista Farina, who as the 10th of 11 children was nicknamed Pinin (“the baby”) and in 1961 changed his surname to Pininfarina by presidential decree. Battista was apprenticed as a coachbuilder to his older brother Giovanni in the Stabilimenti Farina company, but in 1930 broke away and established his own company which he called Carrozzeria Pinin Farina (later Pininfarina). He was by then married, with a daughter, Gianna, and a son, Sergio, who was born in Turin. The new company’s breakthrough came when it built a revolutionary coupé body on a Cisitalia chassis in 1946, later selected by the Museum of Modern Art in New York as an outstanding example of design. This full-width fastback design heralded a new era. Farina bodywork first appeared on a Ferrari in 1952, and the following year the company began series production of bodies for various models of Fiat, Alfa Romeo and Lancia. In 1955, with the Florida body on a Lancia chassis, Farina ushered in the new style of flat panels and sharp edges. The postwar fortunes of the company were directed by Battista’s son-in-law, Renzo Carli, and Sergio, who graduated as an engineer in Turin in 1950 and joined the family firm, becoming managing director in 1961. From the 403 saloon of 1955 onwards they designed many Peugeot cars, and made some of them. One of Sergio’s first tasks was to manage the planning and construction of a new factory at Grugliasco, near Turin, to supplement the existing facilities in the city. The company then became a household name in the UK when the British Motor Corporation (BMC) appointed them as design consultants. The 1958 Austin A40 even adopted the name Farina. This model revolutionized small-car design with its two-box body without a protruding boot. It was followed by a range of larger saloons in 1959, and in 1962 by the Morris 1100 which was an astonishing combination of Pininfarina elegance with the engineering genius of Alec Issigonis. Issigonis hated “stylists” but made an exception of the Pininfarinas, who became great friends. The 1100 went on to become Britain’s bestselling car. When his father died in 1966, Sergio took over as chair of the company. After BMC merged with British Leyland in 1968, the Pininfarina contract was cancelled by the chairman Donald Stokes, soon to become Lord Stokes, although not before Pininfarina had developed a stunning design for a “Berlina Aerodinamica” (aerodynamic saloon) based on the BMC 1800 car. It was turned down by British Leyland but provided inspiration for the Citroën GS and CX, the Alfa Romeo Alfasud designed by Giorgetto Giugiaro, the Rover SD1 by David Bache and Pininfarina’s own Lancia Gamma. Among Pininfarina’s wilder flights of fancy was an even more streamlined shape, the X project of 1961, with four wheels in a diamond pattern; a year later, this was brought closer to reality with the Fiat-based project Y with a conventional wheel layout. Pininfarina’s Sigma safety car design was shown in 1963, followed by a safety grand prix car in 1969. The Pininfarina-designed Peugeot 504 was European Car of the Year in 1969. From 1967 the company pioneered the use of computers in design, and the automated digital measuring of car bodies. In 1972, for aerodynamic research, it opened the first full-size wind tunnel in Italy. In 1978 Pininfarina unveiled the CNR, which had an ideal aerodynamic shape, and jointly with Fiat proposed the Ecos small electric car. As well as continuing links with Lancia and Ferrari, Pininfarina designed many bodies for Fiat sports cars and took over the manufacture of the 124-based Spider from 1982 to 1985. The Fiat 130 coupé was a design of timeless classic elegance and perhaps Pininfarina’s best of the 1970s, while the Rolls-Royce Camargue was less successful in aesthetic terms. A Jaguar XJS-based Spider created a furore at the 1978 British Motor Show and arguably influenced the design of later Jaguar sports cars, while Pininfarina also got the contract to update Jaguar’s ageing XJ saloon. Another unexpected client was the American Cadillac company for whom Pininfarina designed and built the Allante sports car from 1986 to 1993. 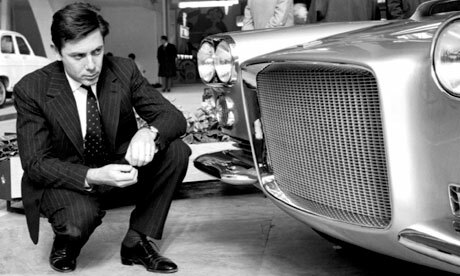 By the end of the 20th century, Pininfarina had become a sizeable industrial undertaking, capable of making 50,000 cars per year in three factories, with a workforce of 3,000. They branched out into interior and product design. In 2008 they produced cars for Alfa Romeo, Ford and Mitsubishi and announced their intention to manufacture an electric car. Sergio served as a member of the European parliament for the Italian Liberal party from 1979 to 1988 and in 2005 was appointed senator for life by the Italian president. He was the chairman of many organisations and committees, promoting European monetary union and high-speed rail links, and was the professor of car body design at Turin Polytechnic from 1974 until 1977. In Britain he was made an honorary royal designer for industry by the Royal Society of Arts. In 2006, Sergio relinquished the chairmanship of the Pininfarina group to his son Andrea and became honorary chairman; the family retained about 55% of shares in the company. Andrea was killed in a road accident in Turin in 2008. By then, the Pininfarina group had expanded to include operations in France and Germany, and a joint venture in Sweden producing the Volvo C70. The company had also accumulated debts of around €600m, with a loss of over €100m in 2007. A rumoured take-over bid from the Indian billionaire industrialist Ratan Tata, who had purchased Jaguar Land Rover, came to nothing but Pininfarina managed to raise new capital and negotiated a debt restructuring programme, hoping to become profitable by 2012. The company pulled out of body manufacture and instead concentrated on design and engineering. Sergio is survived by his wife, Giorgia Gianolio, whom he married in 1951, and by his daughter, Lorenza, and son Paolo.